What I mean is for Control Panel? We have Webmin support in the todo list, but I can't say when we will release it. Each new platform increases support work and now we have a lot of work with resolving issues and updating documentations for cPanel, DirectAdmin and Plesk. I understand that. So, nothing for ISPConfig in the future? Why not? I'll forward wishes about ISPConfig support to our management department. Thanks! That would be great!!!!! Starting from CWAF client version 2.7 all DirectAdmin users with Nginx Web Server can use Comodo WAF protection. 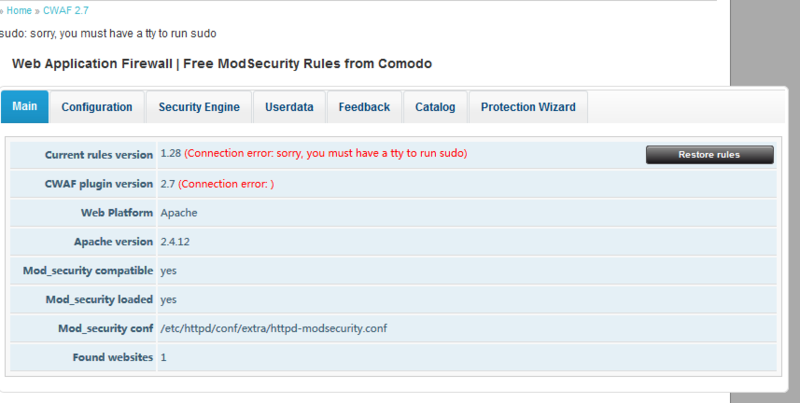 Just install last version of CustomBuild and choose Comodo Rules for Nginx Web Server and rebuild ModSecurity rules. On FreeBSD, check if p5-Net-SSLeay is already installed, before trying to call pkg. pkg install -y p5-Net-SSLeaywill break things. Thank you for suggestion. I will add this to next client release. can't read config /usr/local/cwaf/etc/main.conf: Permission denied at /usr/local/share/perl5/Comodo/CWAF/Main.pm line 27. Compilation failed in require at /usr/local/directadmin/plugins/comodo_waf/admin/index.pl line 10. BEGIN failed--compilation aborted at /usr/local/directadmin/plugins/comodo_waf/admin/index.pl line 10. CWAF use sudo to run high privileged command such as restart Apache etc. Please check if sudo installed, CWAF sudoers file ( /etc/sudoers.d/cwaf ) present and included in main sudoers file (usually /etc/sudoers). Defaults env_keep = "COLORS DISPLAY HOSTNAME HISTSIZE INPUTRC KDEDIR LS_COLORS"
# is not a comment in this case. Can you please try to run this command from unprivileged user cwaf_plugin ?